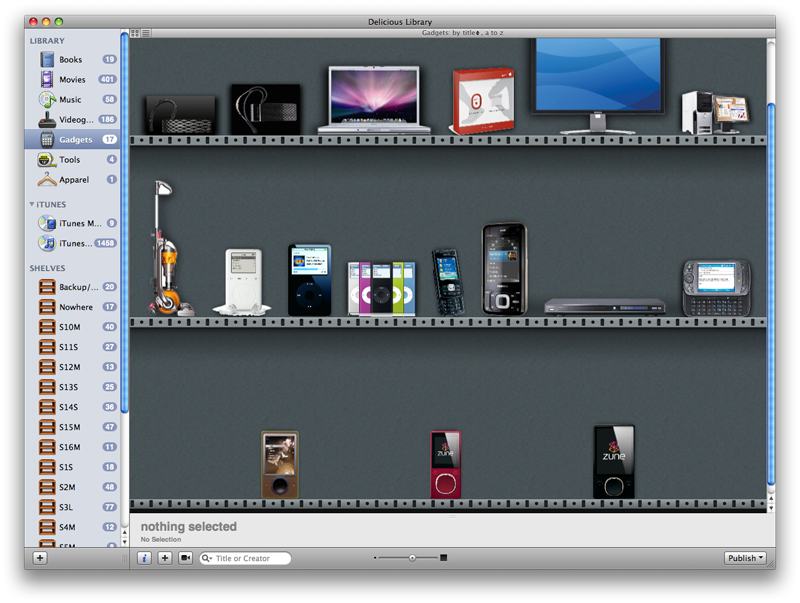 Hands-on With Delicious Library 2.0 - It Tracks Gadgets and Tools! I've been a big fan of Delicious Library for a while, using it to conveniently keep track of what movies, games and books we own and where they are in the house in a visually appealing and searchable way. It revolutionized my DVD storage system, allowing me to shove them into multiple 50/100 disc spindles and then easily being able to see which one they're in just by using my computer. Now with version 2.0 out, Delicious Monster has added three things Gizmodo readers will love: the ability to track gadgets, the ability to track tools and the ability to track toys. It's still fantastic. Adding gadgets is the same as adding books. Just type in the name of your gadget and Delicious Library will search Amazon for similar items, allowing you to pick the one you have and adding it to your shelf. Other options are scanning in bar codes for stuff you just purchased either with your iSight or a Bluetooth scanner, or just manually entering in items and adding pictures yourself (the first two options automatically grab photos). We only had time to enter in a handful of our gadgets, but we like what we see.